Find the best tours. Experience Addis Ababa. Compare and book your favourite. Friendly local guides. Daily life, historyμseums, villages, Ethiopian tradition. 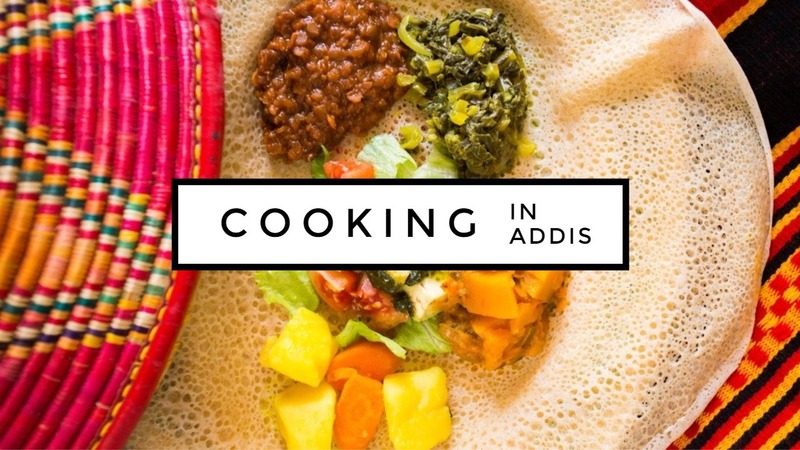 Learn to cook Ethiopian food like the world famous injera. 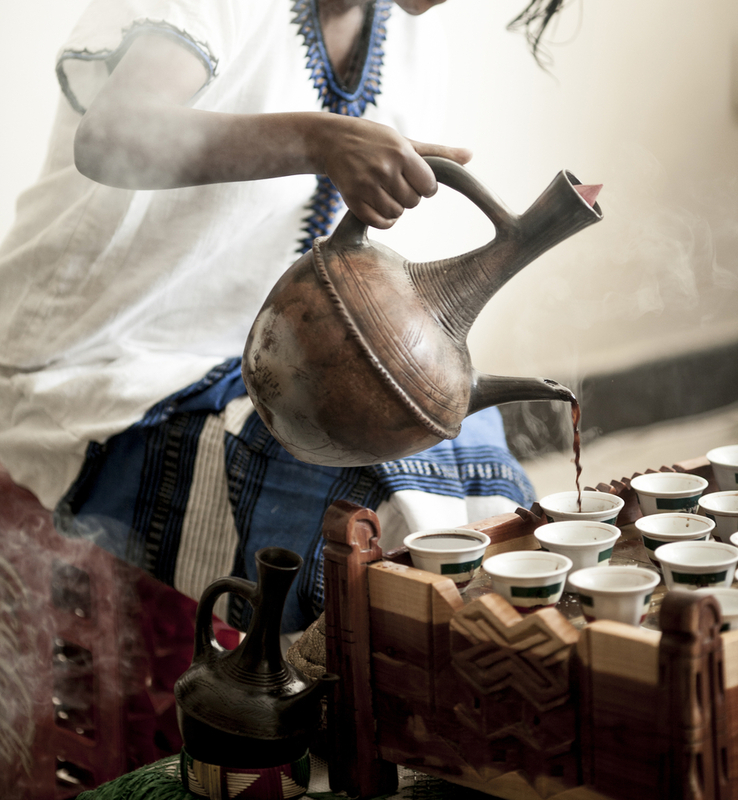 Learn more about the world-known Ethiopian coffee and enjoy a traditional coffee ceremony. Go shopping with your own guide, help with bargaining and meet local vendors. See daily life, meet the elders and medicine man, learn something new. Great opportunities to learn something new. Discover new destinations, new cultures, friendly locals, tasty food and interesting history. Get picked up at the airport and spend the day in Addis Ababa instead of inside the airport. Ethiopia is Africa’s next must-visit destination, and the capital Addis Ababa is the gateway to Ethiopia. There are so many things to do in the capital of Ethiopia Africa Addis Ababa. Markets in Africa are colourful and fast-paced with every type of business, from food to souvenirs and even building materials. Merkato marked is a must to visit while in Addis Abeba. Its an interesting slice of business life, its busy and packed people - as a foreigner, you won't go here without a guide. Meet the local stall keepers and get an insight into how life is here. A local guide will help you with bargaining and finding the best items and tell you about life in Ethiopia Addis Ababa. Try traditional Ethiopian food. Ethiopians love their delicious Injera, which is a flat round fermented sourdough bread with a unique, slightly spongy texture. Tasty stews are added on top of the bread and you will enjoy the meal by eating with your hands. The best time to visit is the dry season from November to February, clear and sunny days but cold nights. The hottest months are March to May with temperatures up to 25C/77F. The wettest months are from June to September. The driest months are January, October, November and December. The capital is located on an elevated plateau 2200 m/7200 feet above sea level, that means that temperature drops quickly after sunset and frosty mornings are common. The temperature in Addis is between 25C/77F and 15C/59F in daytime year round but can drop till around 5C/41F at night. St George Cathedral is built in traditional octagonal form and with a severe neoclassical style. It was completed in 1911 with the help of Greek, Armenian and Indian artists. Empress Zewditu (in 1916) and Emperor Haile Selassie (in 1930) were both crowned here. 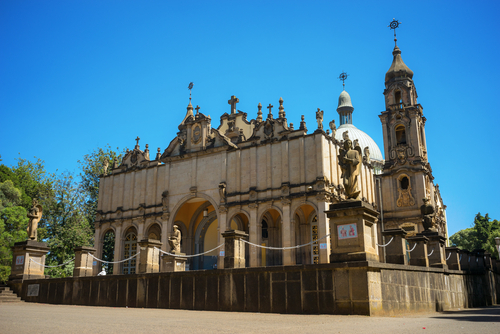 Inside the church, you will see an incredible set of paintings portraying both scenes from the Bible and from Ethiopian history.There is also a small museum with memorabilia from the ancient church and a collection of religious writings, Ethiopian crosses, and clothing. If you want to go inside the entrance fee is per today 200 birr. The most sacred Ethiopian Orthodox church in the capital, and one of the most sacred sites in Ethiopia after the churches of Lalibela. Its a beautiful cathedral built by Emperor Haile Selassie. You can admire the splendid stained glass windows. You will also see the thrones where Emperor Haile Selassie and his empress sat during the masses as well as their tombs. There is also a small museum included in the entrance which is 200 Birr. Meet the world-famous Lucy Dinkinesh, the 3,2 million-year-old lady which is the most intact human-like ancestor. 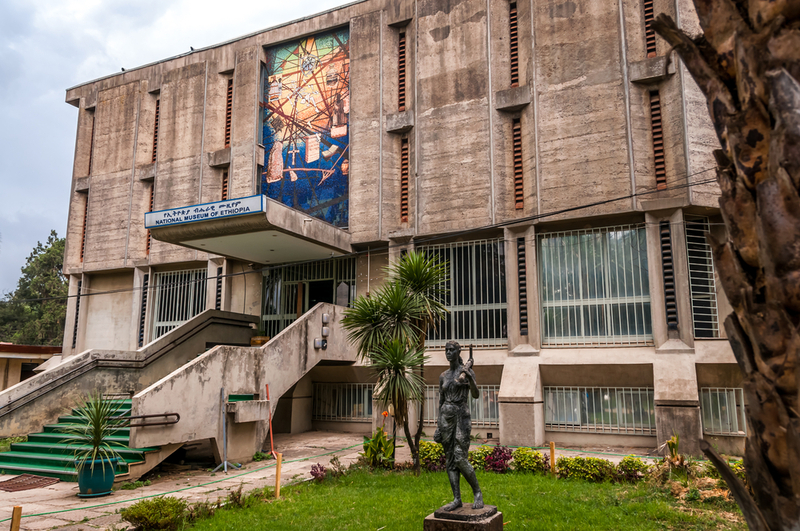 The entrance fee to the National Museum of Ethiopia is less than 1 USD per today, 10 Birr. Haile Selassie’s former palace is a magnificent place which is surrounded by beautiful gardens and fountains. Today it's within the Addis Ababa university’s campus. Since its a former palace, you can also see some interesting rooms such as Haile Selassie bedroom, bathroom, office and his various uniforms. The entrance fee to the National Museum of Ethiopia is less than 4 USD per today, 100 Birr. It is a modern museum showing and explaining the period of “Red Terror” (from 1978-1978). This museum from 2010 is a memorial to those who died during the Red Terror under the Derg government. You will see torture instruments, skulls and bones, coffins, bloody clothes and photographs of victims from the period in Ethiopia when countless innocent people suffered. The museum is free entrance. See Addis Ababa with your own local guide at a very cheap price. You will get picked up ay hotels in Addis Ababa or Bole international airport. Bole International Airport (ADD) is the international airport in Addis Ababa, only 8 km/5 miles from the city. The airport has 2 terminals, all international flights use terminal 2. Ethiopian Airlines has its hub here, there are many flights to Addis Ababa from all over the world to Addis Ababa international airport. Ethiopian Airlines is a part of Star Alliance. 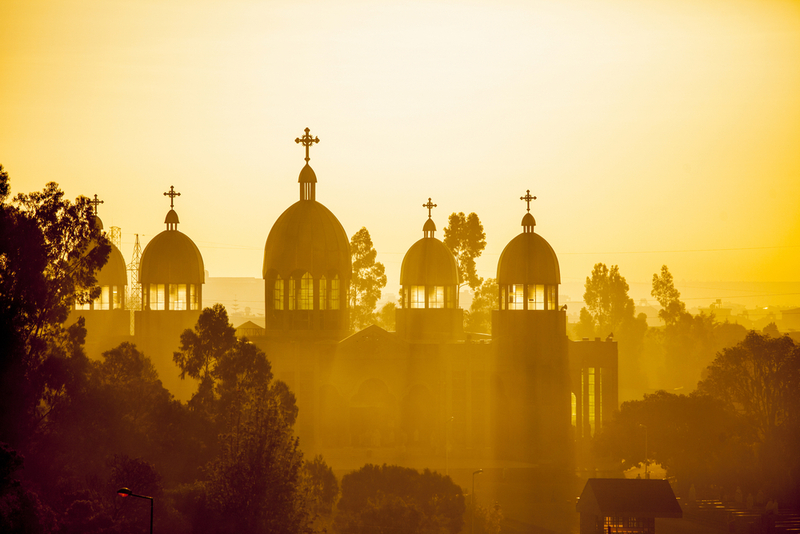 Explore Addis Ababa on your stopover in the capital of Ethiopia. Get picked up at the airport and spend the day in Addis Ababa instead of inside the airport. We recommend an airport transit package where you get your own guide, a tailormade tour and safely back in time. Make sure you have your visa ready for Ethiopia. How big is Addis Ababa? What time in Addis Ababa? Its considered to be extremely safe in comparison to the other cities in the region and moderate crime level in an international perspective. Pickpocketing is more common within the city, while violent crimes are very unlikely to happen. Where is the airport in Addis Baba? Bole international airport is the main airport in Addis Ababa. It lies only 8 km from the city centre. How is the weather in Ethiopia? 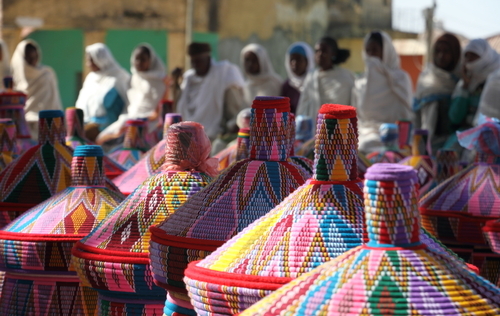 In general, the best time to visit Ethiopia is from November to February. How many inhabitants in Addis? Addis Ababa population is nearly 3,4 million. It's in Africa, and share borders with 5 countries: Sudan, Somalia, Djibouti, Eritrea and Kenya. What country is Addis Ababa in? What to pack when going to Addis Ababa? Light summer clothes for daytime and a jacket/sweater for the chillier nights. In winter we would recommend a sun hat as well. In summer bring an umbrella and a raincoat. If you plan to go above 3000 m/9800ft you must bring warm clothes, gloves and a scarf. We would like to warn you, visiting Ethiopia will be an amazing adventure.